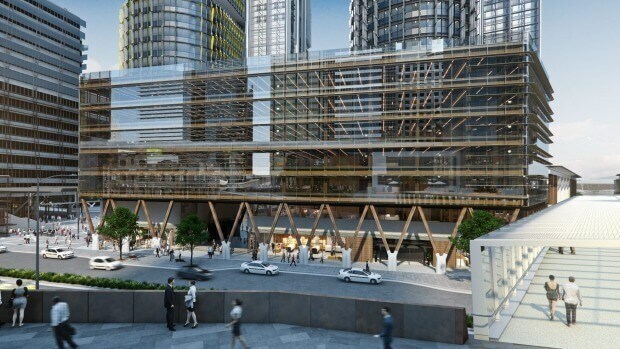 The first commercial office building in Australia made completely from timber will be built by Lendlease as the gateway to its multi-billion dollar Barangaroo development in Sydney. The six-storey International House Sydney will be made from engineered wood – Cross-Laminated Timber (CLT) and Glulam (glue laminated timber) – setting a new benchmark in the use of sustainable building materials. The timbers are sourced from sustainably managed forests in Austria. The CLT has PEFC chain of custody certification. Engineered wood products are prefabricated in a factory and transported to the building site where they are put together like a Lego set. CLT consists of layers of softwood timber arranged crosswise on top of each other and glued together under pressure into large panels. International House Sydney, due to be completed next year, will be located on Sussex Street and will front Exchange Place, an entry point to the precinct, which is expected to host more than 33,000 visitors daily. Lendlease’s Barangaroo South managing director Andrew Wilson said they were on the way to creating Australia’s first large-scale carbon neutral community. “The source of materials is important. To use at scale, timber is the only renewable resource,” he said. International House is Lendlease’s third CLT building in Australia after the 10-storey Forte apartments and the public library, The Dock, in Melbourne’s Docklands. The building was designed by Sydney architect Alec Tzannes, of Tzannes Associates. Mr Tzannes said he aimed to create a new form of beauty beyond shape and surface. “It is ‘deep design’, renewing architecture’s role to serve the greater social purpose of lowering carbon emissions,” he said. The building will have a “clean glass skin”, with the multi-storey timber structure forming the character of the architecture. Mr Tzannes likened the interior environment to the spaces in Sydney’s historic timber or cast iron and brick warehouses. A striking colonnade of hardwood columns will front the street. Above that, all the floors are CLT, the cores such as lifts will also be CLT, while the columns and beams are Glulam and exposed around the lifts. Raking columns will be made of Ironbark reclaimed from old bridges mostly in Queensland and a few in Goulburn. The ground floor will be concrete. International House Sydney will be built on the existing basement underneath the three big towers behind the timber building. The 7910 square-metre office could house a single operator with signage rights at the gateway to Barangaroo, or it could attract a mix of tenants such as smaller finance groups, or technology, IT and media groups. Apart from a lower carbon footprint, Mr Wilson said engineered wood produced zero waste, and was safer and generally faster to build with. He cited a study from Planet Ark that showed wooden interiors improved a person’s emotional state, reducing blood pressure, heart rate and stress levels. “When we fit panels together that are prefabricated, the air-tightness of that structure is a lot better than a conventional structure. The thermal performance of timber is very good. Passive house standards and thermal standards are well developed in Europe,” he said. Mr Wilson said people found Forte and The Dock library “warm, solid and cosy”. “We have seen people hug the timber columns in the library. You don’t see that in a concrete building. There is something about the kind of space those buildings can create which is unique,” he said. No Replies to "Wood Structure Office Tower"